Air Pinch Valve, Air Operated Pinch Valves, Air Actuated Pinch Valve Manufacturers. An Air pinch valve is a pinch valve. Air or liquid pressure is inserted in the cavity of AIR PINCH VALVE - at the control inlet collapses the internal rubber sleeve to provide immediate and positive shut-off. The rubber sleeve closes completely, even on large particulate matter, abrasive and corrosive materials. When open, the sleeve allows full, unobstructed flow with little turbulence. Air pinch valve sleeves can be easily and economically replaced when they wear out. Air pinch valves give fast & positive shut-off of most industrial materials, liquids, and dry flowable materials. Air pinch™ pinch valves will close tightly on suspended particulate materials in liquids. Even highly viscous materials are no problem. Air pinch valves are versatile because of their unique flow-through design. It provides fast & smooth rapid operation, 100% full way, unobstructed flow, and complete close design. It can be mounted in any position or direction, & also works perfect even in fully submerged condition. Air pinch valve housings are light weight and well suitable to use where heavy valves not required or won’t work. investment casting in wcb/cast steel, or investment casting cast stainless steel. No moving parts hence a sturdy long lasting valve at an economical fair price. Operating pressures for controlled material vary depending on sleeve elastomer and valve size, and can range from a moderate vacuum (up to 26" Hg) to a maximum of 90 psi when controlling with air. Required control pressure is normally 20 to 40 psi greater than the material pressure. Use of excessive actuation pressure (air or liquid) than that which results in complete valve closure will impact sleeve life. Use of actuation pressure above 90 psi is not recommended. Airpinch pinch valves are normally open and require constant pressure for complete closure. 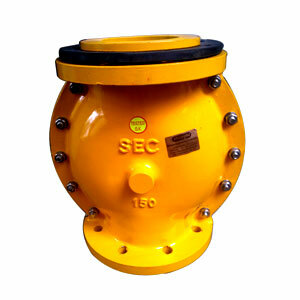 Therefore, a loss of control pressure will allow the valve to open. In the event of sleeve failure, controlled material can enter the actuation system. CAUTION: Airpinch pinch valves should not be used in applications where such conditions could cause system damage or failure. The designer must recognize that sleeve failure can occur at any time. The actuation valve controlling the Airpinch must have free exhaust to allow the Airpinch to open. A solenoid, manual, or air-pilot operated 3-way control valve is required. A check valve cannot be used between the Airpinch and exhaust port of the controlling valve. Using a QEV can improve valve opening response time.